For the non-premium vehicle, see M26 Pershing. 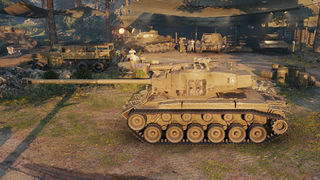 The T26E4 SuperPershing is an American tier 8 premium medium tank. Para incrementar la potencia de fuego, se montó un nuevo cañón largo de 90 mm en el T26E1 en enero de 1945. El prototipo fue designado el T26E4. No se continuó con el desarrollo en enero de 1947 debido a problemas con el cañón y el mecanismo de carga. Un total de 25 vehículos habían sido construidos hasta entonces, pero nunca entraron en servicio. The T26E4 "Super Pershing" is a M26 Pershing with upgraded protection in the form of spaced armor. It is analagous to the M4A3E2 Sherman Jumbo in that it is the up-armored variant of a mobile medium. The T26E4 does not however have access to the upgraded engine or the long 90mm of the M26, but instead does have the similar but historically-accurate long 90mm tested on the tank. The turret face of the T26E4 has very good durability to complement the tough frontal hull. This makes it nearly impervious to HE shells from the front, and allows it to hold positions or assault them reasonably well. The armor, while very tough, is not completely immune to gunfire. The T26E4 has three large weakpoints: the turret cheeks under the "ears" formed by the additional armor welded on, the commander's hatch and the machine gun port on the right side of the hull. Shots entering here will penetrate and deal damage. However these weakpoints are covered up nicely when hull-down on a reverse slope. The T26E4 is very slow for a medium tank and is especially vulnerable while climbing hills or when it has found itself to have been flanked. This, coupled with the T26E4's sluggish turret traverse, means it will often be easily flanked, where its much thinner side and rear armor can be engaged. Likewise, this means the Super Pershing will not be able to flank most opponents, forcing you to fight enemies head-on but at a reasonable range where it will be more difficult for them to aim at the Super Pershing's weak spots. 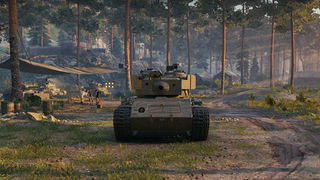 The T15E1 gun has average accuracy, and lacks in penetration, alpha and DPM to face most heavy tanks and may bounce off the front of a well-angled medium from Tier VII and up. When playing the Super Pershing, great care must be taken to aim for the weakpoints on enemy armor, prepare to load premium ammunition, and to keep the three weak spots hidden or constantly moving. 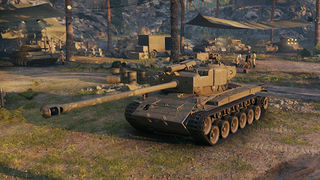 As a premium Tier VIII tank, the T26E4 is a is relatively inexpensive tank in terms of operating costs per battle, but may have trouble generating as much income as other premiums with more effective guns (despite preferential matchmaking) due to its issues generating damage without premium ammo. However, when the opportunity presents itself, the enemy's sides are just as vulnerable to even standard ammo and with its HVAP round the T26E4 should not be underestimated when squared off against an opponent, as players who take advantage of the nearly-impenetrable armor and good performance of the premium ammo are still quite capable of easily destroying tanks the 90mm should never have otherwise penetrated while laughing all the way to the bank. Below average AP penetration, DPM, and dispersion while on move or traverse, among the worst of any tier 8 MTs. Angling the frontal armor too much leaves your soft side armor exposed unless covered by obstacles. Constant ammo rack and gun damage; tiny strip of the top upper frontal armor is only less than 250mm effective. In the patch 8.8 the Super Pershing was "re-balanced." While on paper, it's frontal armor was reduced by 1mm, its angle was changed causing the tank to lose over a third of its effective frontal armor. On the other hand view range and camouflage value received a buff. Accuracy on move and dispersion during turret rotation was significantly improved resulting improved fire control, even if on paper it remains the same. Terrain resistance was buffed and tank can reach around 30kph on flat ground, slightly surpassing the IS-6. Hill climbing still remains abysmal. In patch 9.8, the Super Pershing received further changes to its armor in conjunction with its HD model update. The upper and lower glacis are now protected by 2 layers of spaced armor covering nearly the entirety of the frontal hull, making the tank very difficult to penetrate from the front once more: the upper glacis adds up to about 285mm while the lower glacis has an effective thickness of approximately 250mm. In addition, 102mm of turret face was added behind the mantlet, giving most of the frontal turret effective protection in excess of 300mm. The turret cheeks and "forehead" above the mantlet have also become slightly smaller in area, making it more difficult to snapshot the T26E4's turret weakspots. Overall, the frontal armor of the Super Pershing is significantly improved, and the tank is again capable of leading the charge in a push. The front of a T26E4 is a serious challenge to inexperienced players and tanks at a distance. The front is virtually immune to high-explosive or HEAT shells, due to the mass of the turret armor and the very well-sloped spaced armor on the front. Under no circumstances should HE or HEAT rounds be fired at the front of the Super Pershing, aside from weakspots. The T26E4 is similar to the M26 Pershing in many ways, such as shape and armament; however, the T26E4 suffers a significant decrease in speed and mobility as it uses a very strained 500 horsepower engine that makes it slow while turning, accelerating, and going uphill. Speed is definitely not the T26E4's strong point. Another downside is the very weak sides and rear of the T26E4 which, when combined with sluggish mobility, make it very vulnerable when flanked. Although very difficult to penetrate at a distance, an up-close T26E4 can be more easily dispatched by enemies that are familiar with the T26E4's numerous weakspots. The most commonly exploited weak spots include the large commander's hatch, machine gun port in front armor and turret ring. Face-hugging in a T26E4 is not usually advised- it will be easier for opponents to avoid your strongpoints. Nevertheless, at a medium range, the Super Pershing's frontal armor is resistant to nearly every gun it can see, and the frontal weakspots become very difficult to hit. A T26E4 must be very aware of its surroundings and keep its weak spots and sides protected to fully utilize the potential of its armor. Whereas other mediums may be speedy, thinly armored, and rely on flanking maneuvers and wolf-pack tactics, the T26E4 finds itself better suited to playing as a breakthrough tank. The gun on the T26E4 lacks penetration against heavily armored enemy tanks from the front, though gun handling is usually acceptable given the slow speed. An alternative to targeting weakspots while in a T26E4 are its premium rounds which boast greatly increased penetration. These rounds often exceed the armor-penetration capabilities of non-premium Tier 8 medium tanks. Furthermore, as with most American vehicles, the T26E4 has great gun depression which allows it to hull down and use cover comfortably. It is advised that the Super Pershing attack in a group with heavies when possible and, if available, exploit terrain features using its excellent gun depression and turret armor. When this is not practical, the frontal armor of the Super Pershing is generally superior to that of any tier 8 heavy, allowing the Super Pershing to take an aggressive forward position and absorb heavy fire for its teammates. The durability of the armor also affords the T26E4 the luxury of being able to expose itself out in the open for greater periods of time, giving you the opportunity to fully aim and ensure accuracy. Although you're unlikely to penetrate more heavily armored enemy tanks with your normal AP rounds without aiming at weakspots, your premium rounds will be more effective, and AP rounds can easily punch through the armor of most mediums and light tanks. With careful aim and conservative shots it is still possible to turn a profit while using premium ammo with the Super Pershing, but don't expect to constantly make as many credits as other Tier 8 premium tanks. The 90-mm M3 gun of the Pershing was similar to the German 88 mm KwK 36 used on the Tiger I. In an effort to match the firepower of the Tiger II's more powerful 88 mm KwK43, the T15E1 90 mm gun was developed and mounted in a T26E1 in January 1945. This tank was designated T26E1-1. The T15E1 gun was 73 calibers in length and had a much longer high capacity chamber. This gave it a muzzle velocity of 3,750 ft/s (1,140 m/s) with the T30E16 APCR shot and could penetrate the Panther's frontal armor at up to 2,600 yd (2,400 m). This model used a single piece 50 in (1,300 mm) long ammunition and was the only Super Pershing sent to Europe. A second pilot tank was converted from a T26E3 and used a modified T15E2 gun that used a two piece ammunition. A total of 25 of these tanks were built and designated as the T26E4. An improved mounting removed the need for stabilizer springs. Since M26 was designed to fight the heaviest German armour, weak mantlet proved to be a big problem. It wasn’t able to stop the shells from 88 mm KwK 36 used on the Tiger I, not to mention 88 mm KwK43 from the Tiger II. The designers chose crude, but effective method. They welded additional 80 mm armor plate in front of the mantlet to increase its resilience. Original plate that was welded was salvaged from the destroyed Panther tank.